SCROLL DOWN FOR WHIMSICAL WEDNESDAYS WITH HUGE PRIZE!! I LOVE this little goat image. When Laurie draws a sweet fuzzy baby animal, you know I am going to love it. This is the second time in a month I’ve used this little guy! You can see the other card HERE. I went a completely different way with this card. I went with bright colours while the other card had super pale colours. It reminds me of an ad for Goat’s Milk Soap! Be sure to visit Doodle Pantry for some more fabulous images. And don’t forget to stop by Clearly Delightful June 5th for the month’s BRAND NEW RELEASES!! Paper: white CS-Taylored Expressions, DP-Basic Grey Urban Prairie, riding hood red, black CS-SU! Gorgeous! Love the vintage feel. oh my goodness, this is so stinking cute! love those papers and the 3 little flowers are perfect! beautiful Rebecca! gorgeous design and your coloring is fab!!Blessings! 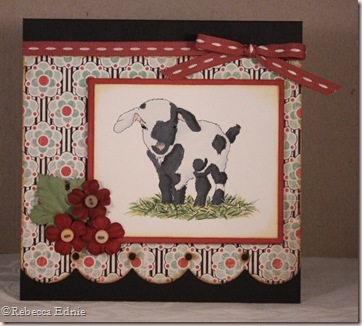 so cute…love your papers you used and embellishments too.. great card. 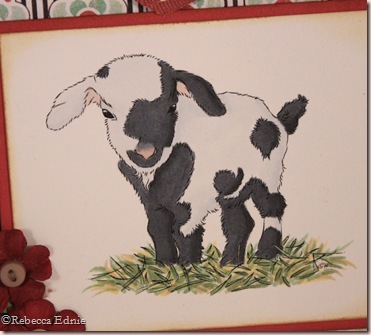 beautiful card and I LOVE the coloring of this sweet little guy! He looks very fluffy and cuddly!